TEHRAN (FNA)- Hezbollah has captured an American and a French spies in its operations in Aleppo, a prominent Lebanese media source revealed on Saturday, adding that the US, Israeli and Saudi intelligence agents helped Al-Nusra Front to find the place of Hezbollah’s martyred military chief, Mustafah Badreddin, and kill him in retaliation. “Hezbollah special forces took captive a senior field commander of the terrorists affiliated to Riyadh and two US and French intelligence officers working in the newly-founded joint operations room of Jeish al-Fatah (a coalition of several terrorist groups) in Aleppo in one of the regions controlled by al-Nusra Front in Aleppo,” Majeda al-Haj, a prominent Lebanese journalist, wrote on al-Sabat news website today. Al-Haj said that the joint operations room was set up so that the French and US intelligence agents can directly command Jeish al-Fatah terrorist attacks in Aleppo and nearby regions. She said the US imagined that the captured spies would be taken to Lebanon and alerted Tel Aviv to bomb the convoy that was supposedly taking the captive American and French officers, “but the convoy that came under the Israeli airstrike was not carrying the captured spies”. She said the US, Israeli and Saudi spy agents in Syria later helped a special team of Al-Nusra terrorists – who received their trainings from Israel’s Mossad secret service in 2012 – to find the place of Hezbollah Commander Badreddin in retaliation for the capture of these officers. Al-Haj said the Al-Nusra team is tasked with finding senior Hezbollah commanders in Syria to assassinate them. She also pointed out that the death of several Iranian advisors in Khan Touman was not the result of clashes with Al-Nusra terrorists, adding that the senior officers were killed in an air raid by the US planes that took off from Turkey’s Incerlik airbase and bombed their operation room in Southern Aleppo. The Lebanese resistance movement’s senior military commander, Mustafah Badreddin, was killed near Damascus military airport in a terrorist attack last week. After his death, a senior politician disclosed that the Lebanese Hezbollah resistance movement is planning to launch massive military operations against the Takfiri terrorists in Syria in retaliation for his martyrdom. “Unique military operations by Hezbollah against Syria’s Takfiri terrorists will be conducted very soon,” Wahib Wahibi told FNA on Tuesday. He reiterated that Hezbollah’s response to the Takfiri terrorists’ crimes will come within the framework of its counterterrorism operations. Hezbollah Secretary Sayyed Hasan Nasrallah assured on Friday that the martyrdom of resistance leaders and the chaste blood of martyr leader Hajj Mustafa Badreddine would only add to its determination to continue in the battle due to faith in its righteousness and in the coming victory. Hezbollah Secretary General initiated his speech by offering condolences to the honorable mother, wife, siblings and children of Badreddine and exposing some of the martyr’s achievements throughout the past four decades. مرافعة نصر الله: رباعية الانتصار في حضرة ذو الفقار…! 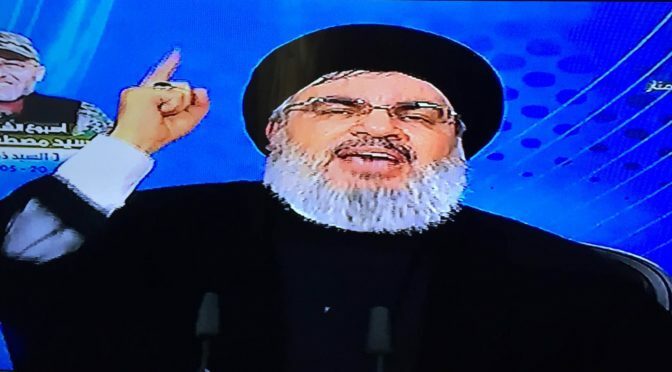 Hizbullah Secretary General His Eminence Sayyed Hassan Nasrallah delivered a speech in which he threatened the apartheid “Israeli” entity that any aggression against any Resistance fighter will make Hizbullah respond outside Shebaa farms. Addressing a large crowd of people at the ceremony held in honor of the Resistance Leader Great Martyr Sayyed Mustafa Badreddine, Sayyed Nasrallah condoled the family of the Martyr, his honorable mother, wife, children and siblings. In parallel, His Eminence thanked all people who showed their solidarity with the Resistance over Sayyed Mustafa’s martyrdom. “Sayyed Mustafa was one of the first members of this Resistance, from its beginning hours. He was at the forefront of confronting the “Israeli” enemy with a group of mujahideen who formed the first brigades of the Islamic Resistance,” he mentioned. “The resistance remained steadfast and it succeeded in failing the “Israeli” targets. The war ended with the so-called April Understanding, which laid the foundations of a new stage in the Resistance work,” he added.In addition, Sayyed Nasrallah emphasized that Sayyed Badreddine played a key role alongside Sayyed Imad Mughniyeh in the Ansariya ambush and in the 2006 war against “Israel” before assuming several responsibilities. “One of the achievements that have occurred during his leadership is developing the media war and psychological war. After that, he continued his work in Hizbullah. Our martyr confronted the terrorist networks in Lebanon and contributed to their dismantling.” he said. “Sayyed Mustafa was also the commander of our operations in Syria and worked side by side with the Syrian Arab Army and the popular forces in defeating the takfiri groups,” he explained. On the comments and fabrications that emerged after Sayyed Mustafa’s martyrdom, Sayyed Nasrallah viewed that the vindictive “Israeli” enemy was fair with us. However, the so-called Arabs from American- “Israeli” agents claimed that Hizbullah didn’t accuse “Israel” because it is afraid of “Israel” and unable to face the repercussions of the response. On this level, His Eminence highlighted that the Resistance’s investigations found no indications that lead to “Israel” in the probe into the Great Leader’s martyrdom. However, he insisted that although we don’t acquit “Israel”, we are also not accusing it. Separately, he dismissed all media reports concerning the Special Tribunal for Lebanon [STL]. “To us, the file of the STL does not exist and we’re not concerned with anything it may request,” he said. In this context, he denounced al-Saud’s actions in the region, particularly in Syria. Sayyed Hassan Nasrallah, who was at his most fiery, eloquent, analytical and explosive today as he eulogized martyred Hizbullah Commander Hajj Moustafa “Sayyed Zulfiqar” Badreddine (R.A.), never fails to remind us why his words are truth at its purest and Mouqawamah at its essence. Never does Abou Hadi fail to drive daggers into the eyes of the Saudi tyrants and all their regional marionettes. Never does the Hizbullah Secretary-General, who is as defiant in every moment of his blessed life as his ancestor Imam Hussein (A.S.) was in Karbala on Ashoura, fail to make the Takfiri terrorist filth quiver wherever they lurk in the shadows. Never does the Arab-Islamic world’s most saintly, most remarkable revolutionary fail to drive the spear of “Hayhat Minna Zilla! (Us, humiliated?! Never, ever! )” further into the heart of the American ZOG which has long sought the Lebanese Islamic Resistance’s end and long come up miserably short in its quest. And never does the Sayyed, OUR Sayyed, fail to drive the sword of Eternal Resistance deeper into that rotting, putrefying, cancerous tumor we call ‘Israel’, filling its devilish usurper leaders and occupation army chiefs with a perpetual fear that will only end when we remove the artificial, genocidal entity from the pages of time. I personally felt that Sayyed Hassan Nasrallah invoked the history of the Jews of Khaybar who Imam Ali (A.S.) righteously crushed and the Khawarij who would murder Amir al-Mou’mineen (A.S.) in the Kufa masjid as a means of establishing a continuum between them and the Zionists occupying Palestine as well as the Takfiri terrorists and their Khaleeji backers today. Nasrallah was doing so not only to obliterate those who were attempting to denigrate Sayyed Zulfiqar’s martyrdom because he fell at the hands of Takfiris and not ‘Israel’ directly, but also to remind us that just as the fitnah which led to Imam Ali’s (A.S.) martyrdom ultimately benefited nobody but the enemies of Islam, i.e. the remnants of the Khaybar Jews and their pagan Arab allies, the Takfiri fitnah of our current time, which is actually fueled by the Khaybar Jews’ successors and their Khaleeji-Wahhabi allies, benefits nobody but those who wage war on Islam and seek to re-colonize our region in the name of Anglo-Zionist hegemony. 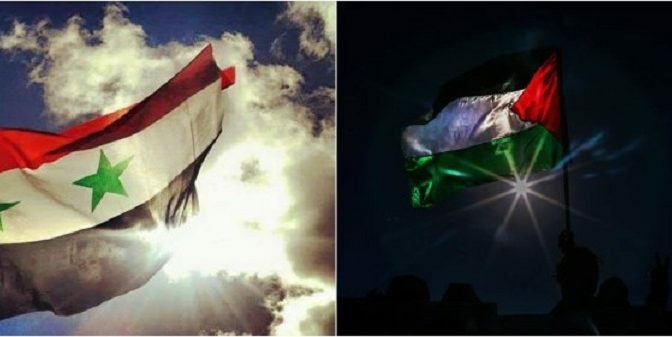 It wasn’t just marvelous or brilliant but utterly genius and should hit close to home for all of us who defend the Syrian Arab Republic day in and day out, doing all we can to end this hysterical disinformation campaign and the Zionist-Saudi-US-Takfiri destabilization plot behind it. The struggle to maintain Syria is a “historic defense of the Ummah”, to borrow Sayyed Hassan Nasrallah’s words, and with a virtuoso leader such as he at the helm, we will most certainly be victorious in totality. Today’s speech was a fitting tribute to Hajj Moustafa Badreddine, one of Hizbullah’s first members, one of its first wounded and its most premier architect apart from Hajj Imad Mughniyeh himself, and it was another beautiful reminder that Sayyed Hassan Nasrallah, may ALLAH (SWT) protect and preserve him ‘till Judgment Day, isn’t just above the clouds when compared to the likes of Al-Saud, Al-Thani and the other godless “Arab” tyrants; he’s in the Heavens, his achievements and glory already etched into history’s fabric, too far from the despots’ corrupted vision to even comprehend.